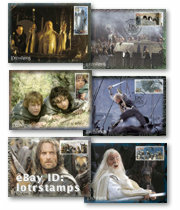 WE PROUDLY PRESENT a wide selection of ‘The Lord of the Rings’ Official Stamps including First Day Covers (FDCs), ever popular Maximum Postcards, Miniature Sheets and picturesque Stamp Booklets along with the Standard FDCs, Gandalf Sheetlets, and sets of Gummed and Self-adhesive stamps. We also stock increasingly hard to find Lord Rings stamps including the deluxe Presentation Packs, Full Sets, and Ultimate Collections - compilations of many popular items, including scarce items not available separately. All these philatelic collectibles were personally approved by LotR movie trilogy director Peter Jackson and many were designed by Sacha Lees at Weta Workshop, one of the same team nominated for countless Oscars at the Annual Academy Awards and winner of numerous prestigious BAFTA Awards. THESE EXCEPTIONALLY DETAILED Official ‘The Lord of the Rings: Fellowship of the Ring’, ‘Two Towers’ and ‘Return of the King’ philatelic collectibles issued by New Zealand Post pay tribute to Professor John Ronald Reuel Tolkien’s epic trilogy, as envisioned by Peter Jackson in his three films set amidst the ruggedly spectacular backdrop of his native New Zealand. Much in demand by collectors, they truly capture the magic and lore of Tolkien’s timeless Middle Earth saga in a form that motion picture enthusiasts, stamp lovers, and literary fans will treasure and enjoy. NOMINATED FOR 30 Academy and numerous Emmy Awards, and winner of 12 prestigious BAFTA/Orange awards as well as being named Movie of the Year by the AFI, ‘ The Lord of the Rings’ movie trilogy represents a proud milestone in New Zealand film making. The New Zealand Post Official Stamps are the only official philatelic release - they were personally approved by the film’s director, Peter Jackson, and all items are authentic, authorized merchandise licensed by New Line Cinema, that commemorate the cast and crew’s tireless dedication and relentless devotion to completing JRR Tolkien’s Rings trilogy on film. Details of all Lord of the Rings DVD and video releases are listed for major international markets. ALL THESE COLLECTIBLES are new and come in archival-quality, clear protective pouches except the Presentation Packs which are protected by a heavy-duty resealable slipcase. As an added bonus, most orders may be mailed with additional ‘Lord of the Rings’ gummed stamps on the outer package, and include a complimentary NZ Post colour brochure containing extensive background information on both this exciting stamp issue, and the epic productions it honours. 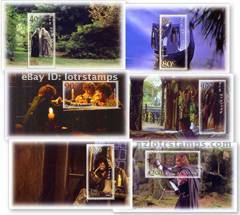 WE CARRY A full range of collectible ‘The Lord of the Rings’ movie stamps; email us for details. With their inevitable popularity, demand for some items particularly the Maximum Postcards with First Day Stamps, has outstripped our limited supply so we restrict the number of our collectible movie memorabilia auctions to stretch out our stock - don’t delay too long or you may be disappointed. If you just missed out on winning an item that we offered (i.e. you were sniped) and you are still after it, let us know. While we make no guarantees, we will try to work something out, so you don’t go away empty handed. IAN BRODIE'S BEST-SELLER Lord of the Rings Movie Location Guide Book 2nd edition which includes a Foreword by director Peter Jackson is available and they make great guide for anyone wanting to visit Aotearoa and explore Middle-earth. It’s 128 pages of full colour with loads of maps, behind the scenes photos, and details on where scenes in Fellowship, Two Towers and Return of the King were filmed. YOU MAY WISH to take advantage of our generous FREE* shipping offer for repeat customers, when you are the winning bidder on several of our auctions. Free shipping offer extends to previous customers - our way of saying “thanks”. All images, logos and trademarks are the property of their respective owners. Portions of the HTML code, images and text contained herein this webpage are copyright 1999, 2001 - 2018 Agitprop Associates and are protected under United Kingdom and International copyright laws, conventions and agreements. All rights reserved. This website is not affiliated with New Zealand Post, Weta Workshop, or any other organization herein mentioned. Agitprop Associates is a participant in the Amazon Europe S.à r.l. Associates Programme, an affiliate advertising programme designed to provide a means for sites to earn advertising fees by advertising and linking to Amazon.co.uk. Access to website granted pursuant to our general terms and conditions. This website previously operated as www.lord-rings-stamps.com.